On Tuesday, August 21st, the Fort Collins Landmark Preservation Commission hosted their 34th annual Friends of Preservation awards. Bud Frick, a former Landmark Preservation Commission member and former chair, was one of the recipients. Bud was traveling during the award presentations, so I don’t have a photo of him accepting his award. 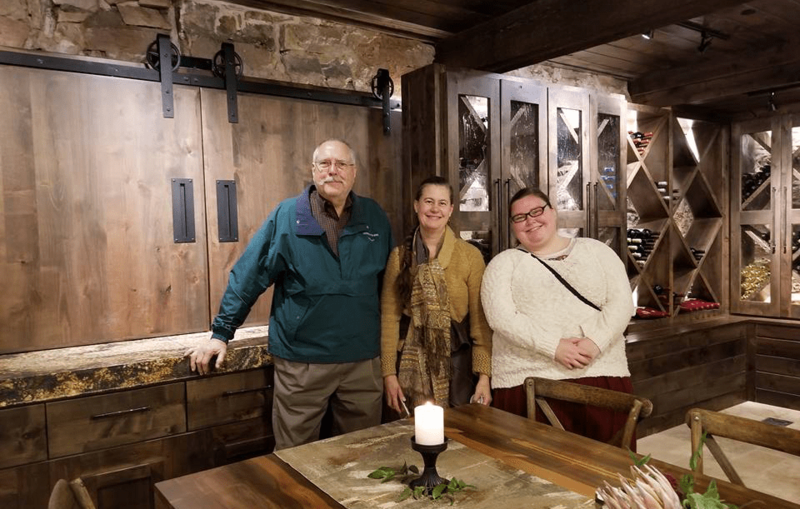 But I do have a photo of myself, Bud and Preservation Department staff, Cassie, at Ginger & Baker (which also received a Friends of Preservation Award this year). Q: Want to hear a joke about construction? A: I’m still working on it. Bud Frick isn’t a scarecrow, but he is certainly outstanding in his field. As an architect, he has played a significant role in the shaping of Fort Collins today, especially in providing sensitive designs for new construction that honored nearby historic buildings — whether they were attached, abutting or adjacent. Bud has also played a significant role as a member, as well as chair, of the Landmark Preservation Commission. He has served on countless Design Review Subcommittees which has helped numerous commercial and residential buildings expand in a way that maintained the overall character of the neighborhoods in which they stand. Bud first joined the Landmark Preservation Commission in 1986. This was before Boards & Commissions were term limited positions. Unlike most sane folk who would escape after one or two terms, Bud stayed on, putting himself at the epicenter of historic preservation in Fort Collins. When term limits were eventually put in place Bud retired from the LPC, only to return again a year or two later. He’s either a bit crazy, or he’s utterly passionate for good design that respects the history, character, and culture of our community. Along with other notables such as Wayne Sundberg, Joan Day, Jim Reidhead, Jim and Doris Greenacre, Carol Tunner, and many, many others, Bud Frick stands as a integral member of the founders of Fort Collins Historic Preservation movement. 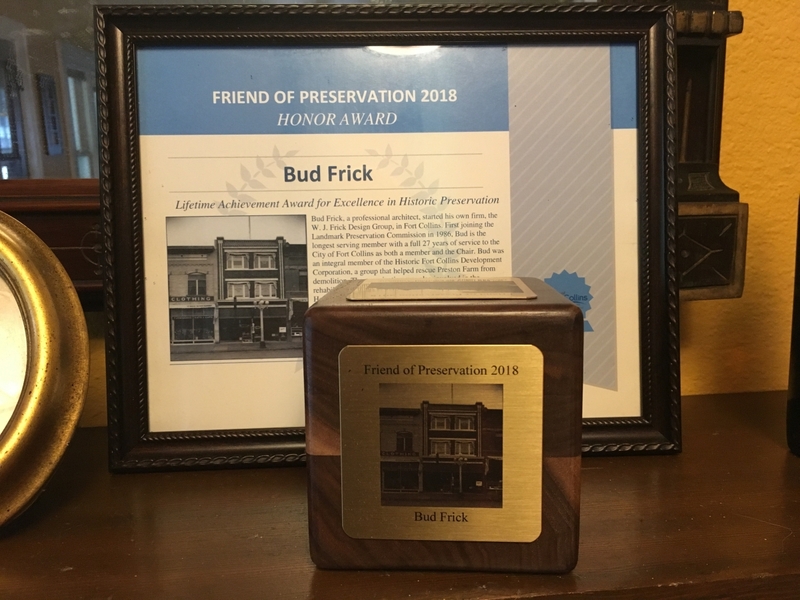 For this, as well as bringing a delightful sense of humor to historic preservation over the years with his many jokes and through the persona of Captain Renovator, we honor Bud Frick with a Lifetime Achievement Award for Excellence in Historic Preservation. Each awardee received an engraved wood block and a plaque.